Scotland is at it's greenest right now. I mean, literally everything is awash in a rich state of emerald beauty. 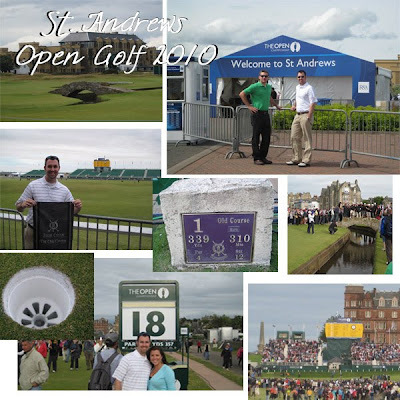 And we've been in our own "green" state, so to speak, setting foot on the Old Course at St. Andrews golf & spa resort merely minutes after some of the world's greatest golf players had cleared the scene. The charming experience rides on the coat tails of our recent good time in Spain celebrating the country's World Cup victory as we watched. We've been so fortunate to have so many wonderful international experiences. Our heads are swimming, still, with all the places we've seen and all the memories made at each destination. This particular weekend started on Saturday, a day of rest for us. I'd been running my feet off at The Open golf Thursday and Friday for the Aberdeen events management company where I work. We accompanied more than 100 clients to the championship, where they enjoyed top-notch corporate hospitality during the golf. And I learned just how many drunk Scotsmen I can put up with on a bus ride from St. Andrews to Aberdeen at the end of the day! Saturday afternoon, our friends, Darren and Allison, arrived from DFW and we took them to the Ferryhill House Hotel for dinner. Our favorite place! They enjoyed heapin' helpins' of fish and chips while I got one of my preferred meals there - the chorizo chili pasta. After we'd had our fill of bacon, toast and eggs, the four of us scrunched into our Nissan Micra and hit the dual carriageway (aka two-lane highway) for St. Andrews. We did have to make a pit stop on the two-hour drive in Stonehaven, though, for them to see the gorgeous Dunnottar castle. I think it's one of our favorites here in Scotland. Though we've seen it at least three or four times, Mike and I can't resist taking a couple photos whenever we visit. This particular trip was especially meaningful as it also marked the last time we'll be there, with our return to Texas just around the corner! There's something about the thistles in Scotland that I absolutely love. Perhaps because it's such an unusual plant to see? When we arrived at the Open, we were immediately struck with the importance of such an event and how incredible it was to see firsthand. We were witness to The Open Championship's 150th anniversary, played by big wigs like Tiger Woods (who didn't do so well this time), Rory McIlroy (the 21-year-old record setter from Ireland) and Louis Oosthuizen (this year's South African champion). We caught the end of The Open and walked much of the course as we followed some of the players. After the awards, the course was opened to the public and we took plenty of pictures of the 1st and 18th holes and the famous Swilken Bridge. The husband was one happy guy! St. Andrews is a small town (by our standards, logging around 16,600 citizens), but rich with history. Known as the home of golf, it houses the Royal & Ancient, founded in 1754, which, according to Wikipedia "exercises legislative authority over the game worldwide (except in the United States and Mexico)." And St. Andrews' namesake University is the oldest in Scotland, dating back to 1410. After a couple drinks and a yummy dinner in the golf mecca, we headed back to our hotel, the Laurel Bank, via taxi. It was about 20 minutes away in a quaint, quiet little town called Glenrothes. The next day it was back into the Micra as we returned to St. Andrews again, this time detouring to the Fairmont St. Andrews Bay resort and spa. While we were comfy and cozy indoors, Mike and Darren braved the rain to play their 18 holes on the Torrence Course. I was proud of them for lugging their golf bags the whole way - it's hard work! After our afternoon tea, complete with mini sandwiches, scones and sweets, Allison and I met the boys in the clubhouse where we sat and enjoyed the bay-area view. Before dropping D & A off at the train station, we pulled through St. Andrews one last time (literally, since Mike and I won't be back there again!) and snapped some pictures of the impressive cathedral ruins. It took 150 years to build, completed in about 1318, and was the largest church ever built in Scotland. Uprisings and the pillaging of stones by townspeople left the cathedral in it's current state of ruins. Everything was moist and damp from the fresh-fallen rain, a busy weekend washed clean by nature's elements. It seemed to age the ancient stone walls that still held their own at the St. Andrews castle - also left in ruins and propped atop a grassy cliff overlooking the glassy clear ocean. Once we were sure D & A were able to catch a train from their itty bitty train station in Leuchers, Mike and I drove back to Aberdeen, jammin' to our country music and taking in all the pretty scenic views, fat fluffy sheep and landscaped hills. Gorgeous, green and grand, our days here are numbered! "If a golfer is going to be remembered, he must win at St. Andrews." Beautiful! Makes Louis Dean want to go back! (he says!) We saw the castle in the ice....now we see it in the green! Soak it all up! It will be time to come home before you can blink twice! And Honey....it is HOT here!! The lows at night are hotter than the highs you have in the days there! I will be seeing you soon.....at the 'International Arrivals' door! We will be the ones decked out in red/white/blue!! Martha Stewart: Perfection Be Gone!